Most Viewed & Sold Product Count Magento 2 Extension enhance your store content by allowing to display most viewed products and most sold products count. 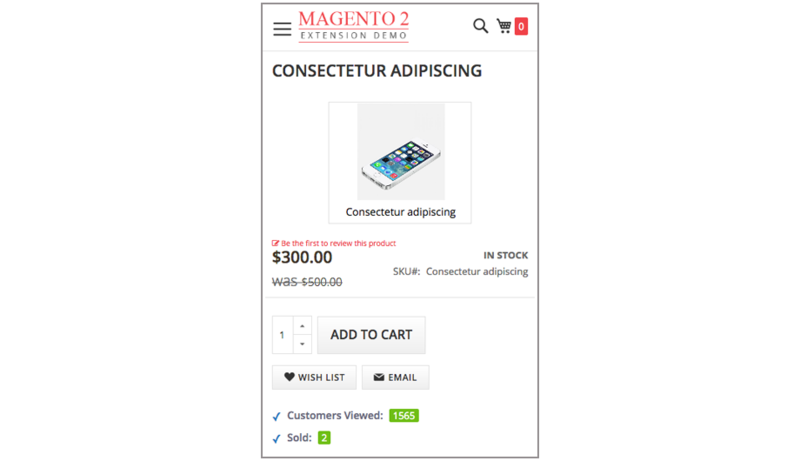 By default magento backend has no option to display sold products count, but this extension allows you to display most sold products count on the product detail page without affecting any core files. This will make your products more valuable and demandable. Most viewed product count display on the basis of how many times customers/visitors viewed these products. Same as Most sold products count display on the basis of how many times products are sold and get sold products count from the sold product report of your store. Display real time count for most viewed and most sold product. 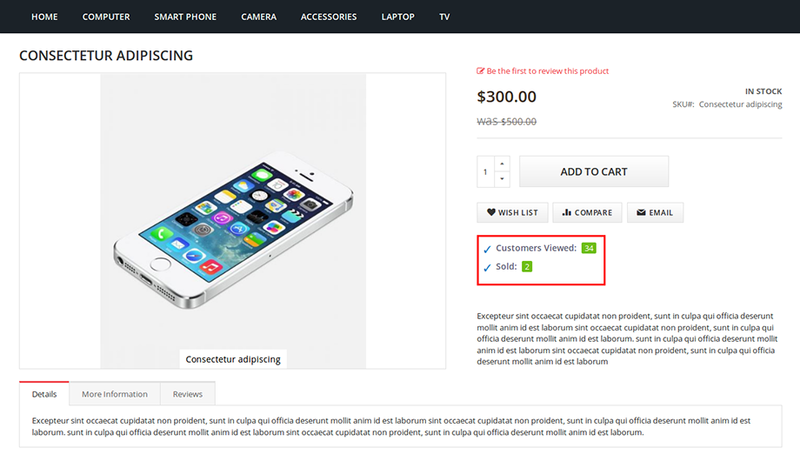 Display Most Viewed Count on product view page to showcase customer engagement. Display Most Sold Count on product view page to showcase customer order. By showing real time count, this will help to encourage customer to buy this product. Extension is very useful. Support team responded immediately to me when i needed. Really appreciate their dedication. Download the Most Viewed & Sold Product Count extension .ZIP file from solwininfotech.com using your Solwin Infotech website account. If you are using Magento 2.0.x then you need to extract solwin-mostviewsold-m2-2.0.x.zip file. If you are using Magento 2.1.x then you need to extract solwin-mostviewsold-m2-2.1.x.zip file. If you are using Magento 2.2.x then you need to extract solwin-mostviewsold-m2-2.2.x.zip file. If you are using Magento 2.1.x then you need to extract solwin-mostviewsold-m2-EE-2.1.x.zip file. If you are using Magento 2.2.x then you need to extract solwin-mostviewsold-m2-EE-2.2.x.zip file. Now, you can see the Solwin menu in admin panel. 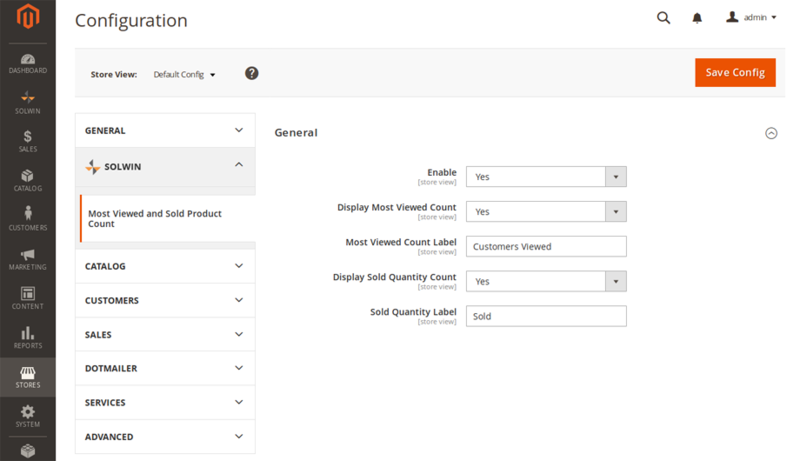 Please go to Solwin -> Most Viewed & Sold Product Count -> Configuration and select Enable to Yes.